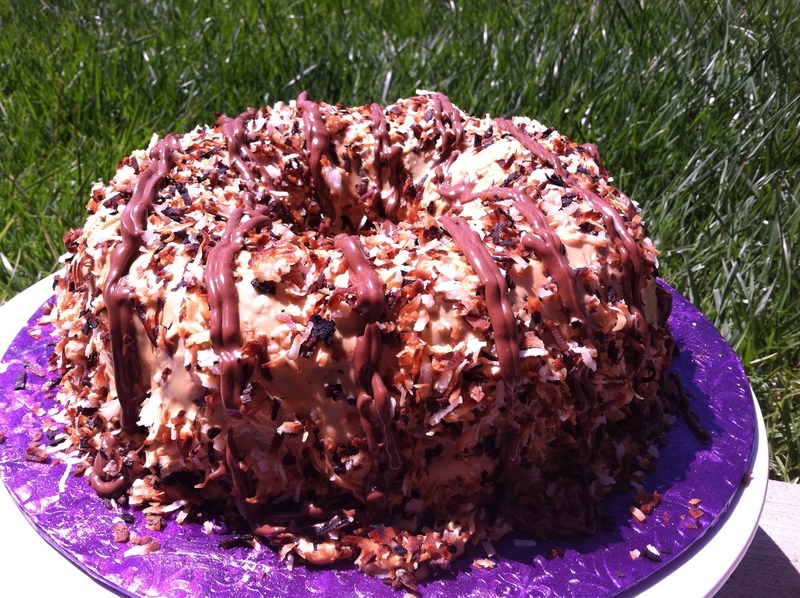 I found this Samoa cake on pinterest and thought it was so cute. When I read the recipe, I thought it sounded delicious, but that the recipe (which apparently took all day to make) was way too complicated. I was so totally not up for an all day recipe. I didn’t want to go too traditional either, though. I still wanted the cake to be rich and distinctly different from a boxed cake mix. So here’s what I did. I started with a chocolate cake mix and a vanilla cake mix. I followed the measuring amounts on the box, but instead of water, I used milk, and instead of oil, I used melted butter. I also added a chocolate instant pudding to the chocolate cake mix and a cheesecake instant pudding to the vanilla cake mix. Honestly, these changes alone made this a really really rich cake. For the frosting, I did the whole sweetened condensed milk in the crockpot caramel recipe. Super easy, I must say. Then I added about ¾ cup butter and about 2 cups of powdered sugar. I also added ¾ cup shredded coconut. This made for a pretty soupy frosting, but considering the end goal, I liked it. I toasted some coconut to cover the cake with after frosting it. Be careful, I miserably burned my first attempt. I had been watching it pretty closely, and it went from completely white to charred black in the last thirty seconds. Oops, after about a two minutes, it suddenly turns! Ooops! Thank you, Kitchen Smoke Alarm, for alerting me that these guys had burned! Oops! 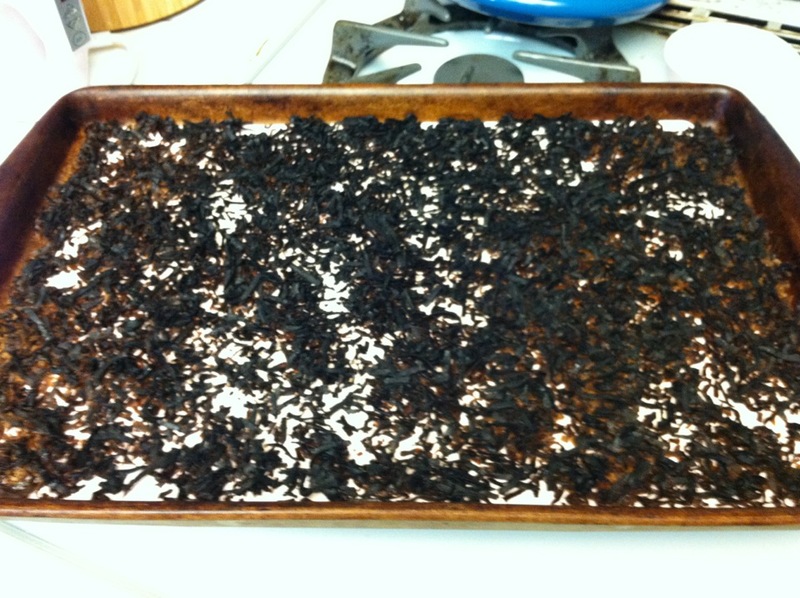 Thank you, Kitchen Smoke Alarm, for reminding me I had this in the oven! Once the coconut was neatly covering the outside of the cake, I melted a bit of chocolate chips, put them in a ziplock bag and cut off the corner to drizzle some stripes. I used a dark purple foil for the board since that’s the color the Girl Scouts use on the Samoa boxes. The cake tasted so good. But beware, this cake is super rich. And with these modifications to the original recipe, it didn’t have to take all day.